We have the many wonderful walking trails in Tipperary, through forests, hills and valleys and along the river Suir. Witness the wonders of nature as you breath in the clean country air. Golden to the Rock of Cashel – 10km linear walk along the River Suir ending at the Rock of Cashel. Appreciate the heritage, wildlife and flora all around. Capture the Castle – 2km linear walk from Cahir Castle to the Swiss Cottage. A pleasant wood and riverside walk. Loop the Loop in Ballinacourty – 11km looped walk from Christ the King in the Glen of Aherlow follow the waymarked path and take in the breathtaking view of Tiipperary’s Galtee Mountains. A walkers paradise where there is always a welcome. Looped walk Red or Green – great for the kids, have a picnic and make a day out of it. Discover the Unknown.. 14km looped walk at Goatenbridge. Follow the forest paths with fantastic views of the Knockmealdown Mountains. A Hidden Gem – 5km looped walk at Glenbawn Woods near Clonmel. Take time out to walk the Dun Ui Faolain loop, a hidden gem on the outskirts of Clonmel, beyond Marlfield Village. There are three extremely pleasant 5 km rambles through old woods and along the banks of the River Suir. Butlers & Castles 10km linear walk from the Ormond Castle in Carrick-on-Suir to Kilsheenlan. Relax along the River Suir and use the local bus to bring you back to your accommodation in Carrick-on-Suir. Walk the Walls 2kms – historic Town Trail of Fethard’s medieval walls, built in 1292 and explore its Norman history and Irish culture. Bogs & Butterflies 3kms looped walk. Visit the best bog in Tipperary – the Lough Derg Bhile Loop is rich in biodiversity & a haven for butterflies. Bring a picnic and spend time exploring the flora & fauna. Overlooking Kilcooley 6kms Looped walk Grange-Crag loop with its Victorian Ice House and Wellington Monument, looks down on Kilcooley Abbey and has views across the whole of Tipperary. There are many golf clubs in Tippeary for Golfers. Tee off on fabulously maintained courses and enjoy a relaxing day of golf. See Tipperary from your bike. Enjoy the country and see the historic sites of Tipperary. Spend time meeting the locals, telling them where you’ve been and where your heading. (42 miles/67km). Glen of Aherlow. Forest Parks. Tolling parkland. County Museum, Clonmel. Museum of Transport –Richmond Hill. River scenery. Marlfield Nature Reserve. CASHEL RESTAURANTS Cashel boasts many fine restaurants and we cater for all tastes. The lush pastures of the Golden Vale contribute to our delicious dairy produce and our distinctive farmhouse cheeses. We recommend Cafe Hans for high quality food during the day at reasonable prices. We also recommend Chez Hans for fine dining at night. Day time restaurants/ pub food -Feehans, Mikey Ryans, Ladyswell RestaurantFor coffee/teas and home made cakes we suggest Spearmans Bakery & Tearoom. Cashel B&B is in the centre of Cashel town just minutes walk from the famous Rock of Cashel in county Tipperary. Enjoy our cosy bed and breakfast accommodation. Cashel B&B is a popular Bed & Breakfast near the Rock Of Cashel in Cashel County Tipperary. We provide excellent Hotel Style Accommodation. Cashel town is a famous tourist area to visit with the famous rock of Cashel located in Cashel county Tipperary in the province of Munster. This famous tourist attraction in Ireland has a historic significance to the town. 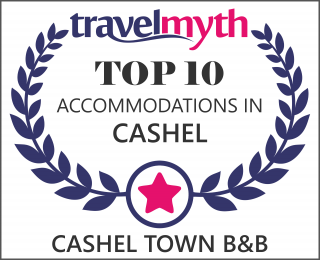 Stay at Cashel B&B for bed and breakfast and accommodation.